As Jeremy Kimm is working on another Victoria Big Year, I dropped him a line on Saturday evening to see if he had plans for Sunday birding. It was on his agenda, but he hadn't made up his mind whether to head out west to Sooke or north to the Saanich Peninsula. We decided to meet at my place and then I'd drive us around for some field birding on the peninsula. When I woke up at 8 a.m., the rain was coming down in sheets and I thought it would put a bit of a damper on our birding. When Jeremy K. showed up just before 9 a.m., the rain was still coming down but the pace had slowed considerably. Coffee was supposed to be the first order of business, but we found decent flocks of gulls, geese, and wigeons on the polo field next to Maber Flats on the way. We hopped out and found a couple Greater White-fronted Geese in with the Canada Geese. We noted another flock of geese that seemed to be over the fields off Stelly's X Rd., so we drove over there to check it out. There was an impressively large flock of geese and we could see a section of the flock was made up of Greater White-fronted Geese. We made sure to count them up and the total came to 56 in all. We still weren't in the clear for getting coffee as we spotted a stunning male American Kestrel on the wire just before Centennial Park. While watching the kestrel, it dashed off and we looked up to see a Peregrine Falcon racing by overhead. Despite seeing a Mourning Dove on the wire almost a kilometre further down the road, we decided not to stop so we could finally get some java in our systems. We zigzagged up and down the peninsula seeing the usual suspects until we made a stop at Saanichton Spit. Jeremy K. hadn't visited the spit this year so there was one specific target he was hoping we would find. 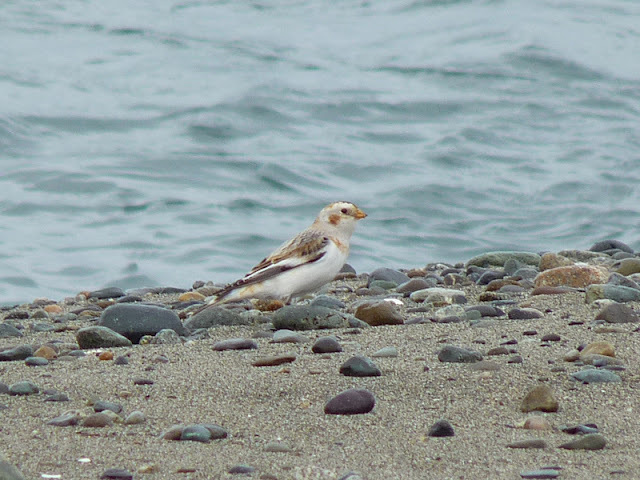 A lone Snow Bunting has been present out near the tip of the spit for nearly a month and a half and, since they are a rare overwintering species in Victoria, it was still missing from his year list. Right on cue, the Snow Bunting flushed from the dune-like habitat near the tip and landed on the beach. After Saanichton Spit, we drove through Martindale Flats and found a staggering number of gulls in the field just south of the pig farm at the end of Lochside Dr. We couldn't find anything too interesting, but the adult Ring-billed Gull was easy to pick out due to its pale, silvery mantle set among darker-mantled Mew Gulls. Next, we were able to find the flock of blackbirds that almost certainly has the Rusty Blackbird near the corner of Welch Rd. and Martindale Rd. The flock refused to stay settled and it wasn't long before they left the field and landed in a roadside tree. We didn't have the patience to continue picking through for the Rusty because we had two more birds we were hoping to find before the day was done. Jeremy K. had not made much of an effort for murrelets to date, so we headed out to Kwatsech Park which provides a great view over Glencoe Cove and the Strait of Georgia. The rock bluff is a great site to seawatch and both Marbled and Ancient Murrelets can usually be found reasonably close. Today, I could barely make out a group of Ancient Murrelets way offshore and Jeremy K. couldn't even make them out in my scope. I said we should save ourselves all the squinting and just head out to Ten Mile Point. We did just that and the results were much better. After a few minutes, we had a nice pair of Marbled Murrelets and a couple groups of Ancient Murrelets. While discussing local wildlife and climate change with an older fellow that was interested in what we were doing, both murrelet species gradually moved in closer to shore and a Rhinoceros Auklet offered crippling views. Despite the mediocre weather, we had a great day and finished the day off with 77 species, by my count. It's always amazing to see a total like that without attempting to maximize diversity!